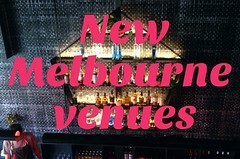 Excuse the interruption in regular programming, but Melbourne Gastronome is in New York and San Francisco for the next three weeks! Currently writing to you from the beautiful "loftette" that best-friend-K and I have sublet in Williamsburg, Brooklyn. The damn fog delay in Melbourne on Tuesday meant that we missed our connecting flight to New York from Los Angeles, so b-f-K and I had an unexpected 24 hour stopover staying at the Hilton LAX courtesy of Qantas. I picked up some nasty flu-like symptoms on the flight over (hoping it's not The Swine), so I'm taking lots of cold n flu meds and hoping the feverish aches and blocked sinuses clear up soon so that I can attack New York with the vigour it deserves. Over the next few weeks I aim to write up a few culinary highlights of my trip (and a big thank you to those Melbourne Gastronome readers who've left comments or sent emails recommending places I should visit - I transcribed every suggestion into my little red notebook! 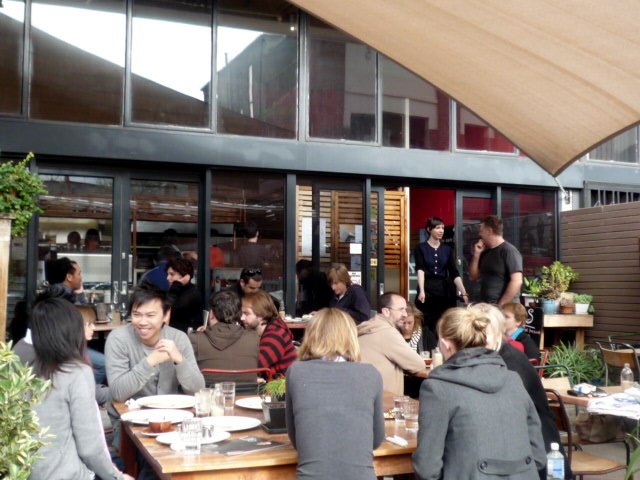 ), but in the meantime here's a review from my last weekend in Melbourne. The Ladies Who Lunch became Ladies Who Brunch when they took me out for a farewell brunch on Sunday. Appropriately enough considering my travel destination, they chose New York Tomato as our brunch venue. 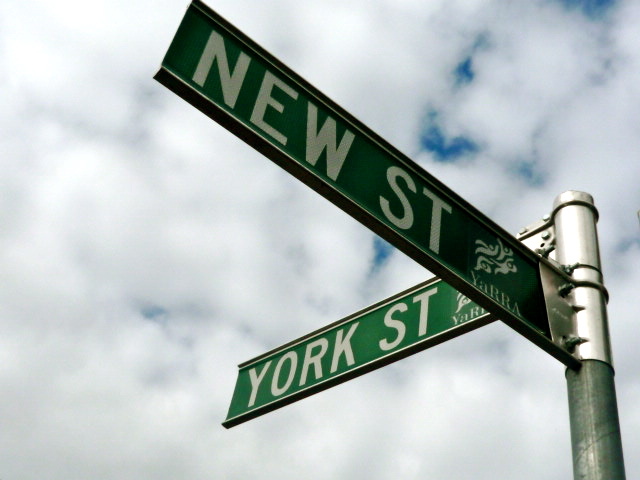 NYT is not named after the Big Apple, as you might expect, but after its tucked-away location on the corner of New Street and York Street in Richmond. 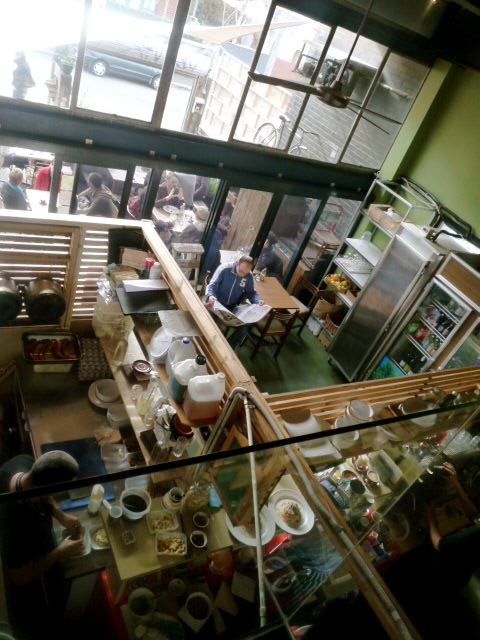 I hadn't been to NYT since before I started writing Melbourne Gastronome, and I must say I was most impressed with the quality of the food - even more so when you take a birds eye view of the place and appreciate what cramped quarters their kitchen staff are working in. 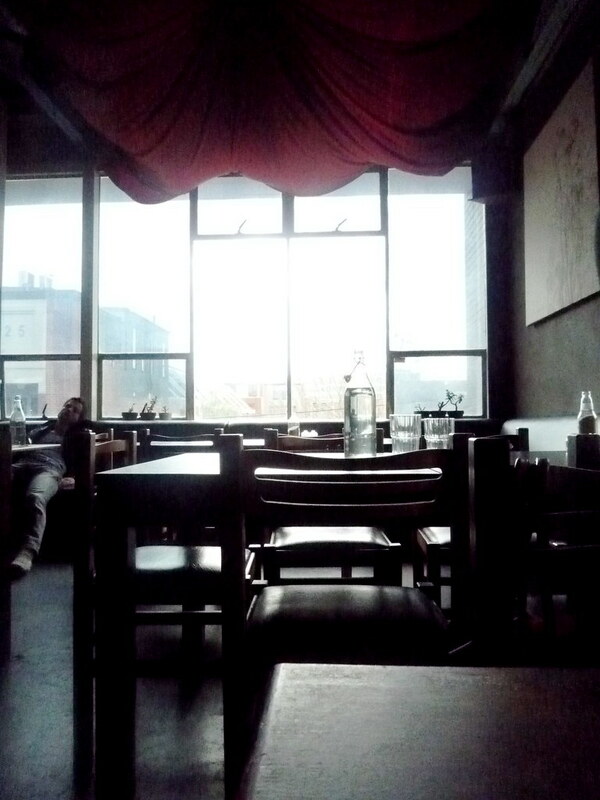 The place was doing a roaring trade at 11am on Sunday - so much so that the only spare tables were in a cute little upstairs room I was previously unaware of. 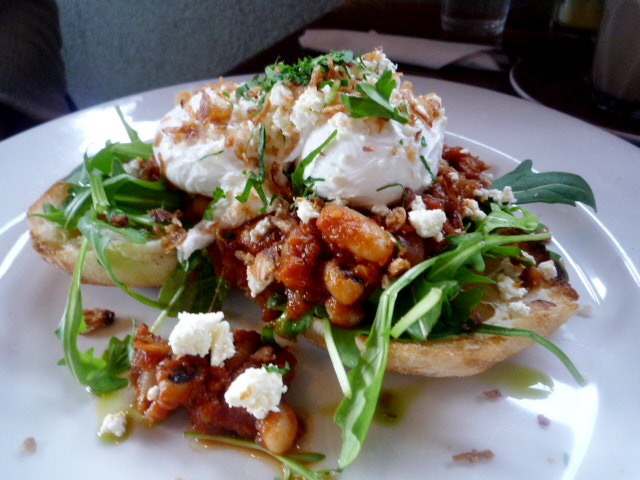 Miss L had one of the specials: poached eggs on Turkish toast with smokey beans, chorizo, rocket, fetta and crisp shallots ($16.50). I tasted the beans - they really were wonderfully smokey. 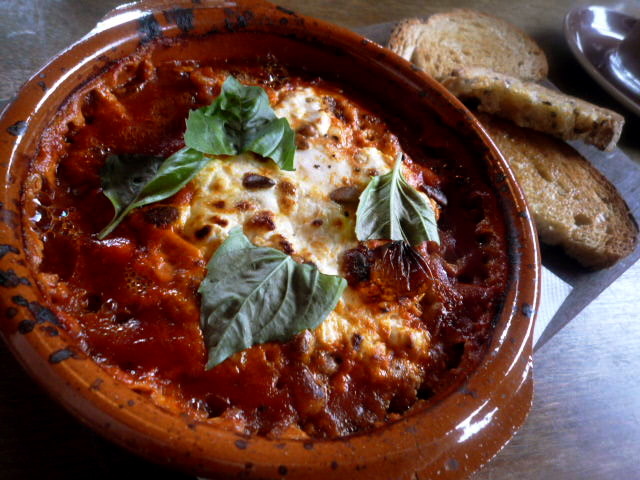 I was in a tomatoey mood so I ordered the free range eggs baked in a claypot with napoli sauce, goats cheese, basil and pine nuts then served with toast ($15). All rather simple familiar flavours, but such a hearty and nourishing winter dish. My favourite of the dishes though had to be what Miss T ordered: mushrooms roasted with caramelised onions, slow roasted garlic, basil, porcini oil and parmesan nut wafers ($14.50). 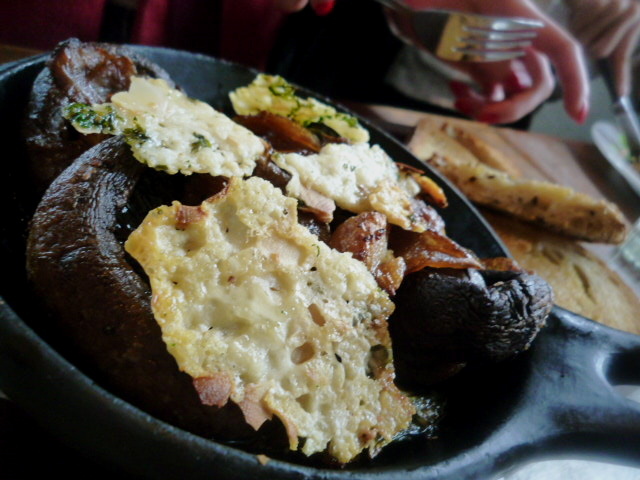 Oh this dish was so so good: the rich fleshy mushrooms, the soft garlic, the crisp wafers. 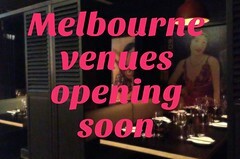 I'm making it a priority to go back and order it when I return to Melbourne. 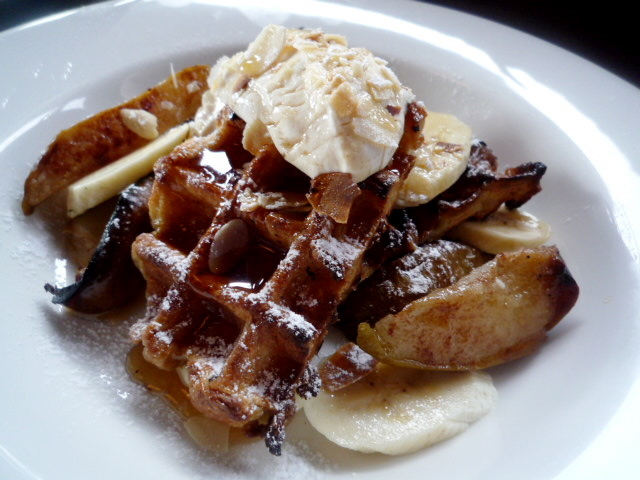 Miss B wanted something sweet, so she ordered the Belgian waffles with banana, cinnamon roasted pears, spiced labna and orange blossom maple syrup ($14.50). Another winner - the waffles had just the right crisp-but-slightly-chewy texture, and the orange blossom in the maple syrup and the spices in the labna came out beautifully. On the strength of this brunch I'm adding New York Tomato to my shortlist of best brunches in Melbourne! Oh-Dear what a shame about the fog snafu - nut on the other hand - I've walked / driven past NYT a number of times and not stopped, I am now inspired to do so. Baked eggs... yum! As a Richmondite, I can't believe you haven't been to NYT since starting your blog! It's pretty much my favourite breakfast place. The food is always perfect, and interesting. I love that they always have two specials on the weekends (which are usually pretty hard to go past) and the menu seems to change relatively often. (However, I'm a bit sad that they removed my ideal breakfast from the menu - poached eggs, prosciutto, caramelised onion, fresh basil, preserved lemon oil; topped with the most perfect grainy mustard hollandaise in existence... oh my...). I did stop going there for a while after having a TERRIBLE encounter with a member of staff, but she seems to be gone now, so it seems to be back on form. Just be careful not to turn up with more than 6 people, or try to push two tables together..! ps I hope you're feeling better and able to do some real NY exploring! We have just added your latest post "Food and restaurant review blog" to our Food Directory . You can check the inclusion of the post here . We are delighted to invite you to submit all your future posts to the directory for getting a huge base of visitors to your website and gaining a valuable backlink to your site. We have scraped your last post and intend to keep doing so. We will post an excerpt and link to your site on our page, which nobody visits except by accident. This is for our own benefit and profit, and will bring you no joy at all. But we would like you to think we're doing you a favour. Hi Essjay - oooh, glad to have inspired you! Hi Hannah - yes, I know, it's ridiculous that it's taken me two years to get around to reviewing NYT! My paltry excuse is that I live at the other end of Richmond (south of Swan Street) and don't have a car... paltry, I know. Your ideal breakfast sounds divine. There were sooo many nice-sounding dishes on the menu, including the other special: scrambled eggs on toasted sourdough with smoked salmon, coriander, spanish onion, harissa mayo and citrus oil! Ha, thanks Zoe! This foodnrecipes mob keep pinching my content without asking, but surprise surprise they provide no contact email address for me to write to to request that my content is removed from their site. Grrrr. That place looks really nice! Another one to try in Richmond. I hope your trip is totally awesome so far and you're feeling better soon. Can't wait to see the upcoming posts from the Big Apple! Can't wait to hear about your NYC travels! I'm heading there in November, so excited to get some tips. Definitely will give it a go. Always looking for good breakfast places. Just stumbled across your blog - nice work. Enjoy NYC.